A 30-member strong contingent of freestyle and Greco Roman wrestlers, including 10 in the women section will embark on a journey to compete in the Junior World Wrestling Championships, to be held in Slovakia between September 17 and 23. The Junior Championship (U-20) is billed as a major stepping stone for those aspiring to make it big in the sport. The Slovak event will also be significant for the junior Indian grapplers as they look to emulate Bajrang Punia, who became the first Indian to win a wrestling gold for the tricolor at the Jakarta Asian Games, a feat that has eluded the Junior team for the past 17 years. Indian wrestlers had managed to claim a bronze in each category—men’s freestyle, Greco Roman and women’s freestyle—in the Paris world meet last year after the team had gone without medals for three years. The last time India won gold at the world juniors was way back in 2001during the Sofia (Bulgaria) meet where our wrestlers had picked two gold medals. Since then the precious yellow metal has eluded the Indians and the present contingent, led by youngsters like Deepak Punia, Sachin Rathi, Suraj and Sandeep Singh Maan, to name a few, would want to set the records straight. Speaking of the upcoming endeavour, WFI president Brij Bushan Sharan Singh sounded very upbeat and confident. “I have a lot of faith in the young talents that will be on view in Slovakia. The coaches and players have worked hard, I am very optimistic of their performance. Our aim will be to flourish and perform well in all age groups,” said the WFI chief. The team looks high on confidence, the result of a four-month long training and their confident show during the Asian Championships in New Delhi, where India bagged eight medals including two golds, in July this year. The wrestlers coupled with medals from Junior Asian and Cadet championships will thus be keen to make the experience count in Slovakia. The Greco Roman events have been India’s Achilles’ heel but, over a period of time, our wrestlers have shown improvement. This gives hopes for the country, especially from Sajan who won a bronze medal in last year’s world championship in 77kg. The Asian gold medal winner, who has the potential to beat the best, would be eager to return home with a gold this time around. Of course, there are other wrestlers in lesser weight categories like Vijay, Sagar and Saurabh whom we can expect to spring a surprise. As for women wrestling, India can be hopeful of some exceptional performances. The women’s contingent will be spearheaded by 2018 Asian Cadet Gold Medallist and a 2017 Cadet World Championship Anshu among others. “We are thrilled to be part of the Indian squad and we will give our best shot. We have trained well and worked hard on our technique; we are confident of a good show,” said Anshu, who will be representing India in the 59 Kg. 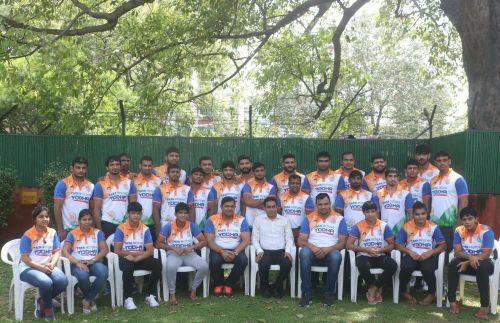 The 30-member contingent which embarks on a journey in a bid to etch their names in the history books will be is accompanied by nine coaches and support staff. The Wrestling Federation of India (WFI) is the Governing Body for Wrestling in India recognized by Ministry of Sports, Govt. of India as National Sports Federation. WFI is registered under the Societies Act and affiliated to Indian Olympic Association and International Federation of Associated Wrestling Styles [FILA]. WFI was formed in 1960 and Wrestling federations of all States/Union Territories are its Member Associations. WFI along with its State affiliates are entrusted to organize National Championships for all categories of Wrestling, players apart from Zonal, Inter State Championships and All India Ranking Tournaments in India. WFI also conducts various International Tournaments along with the various grassroot initiatives. WFI through its commercial partners Sporty Solutionz initiates a historic partnership with Tata Motors who come on board as a Principal Sponsor for the Sport till 2021. Tata Motors Limited (BSE: TATAMOTORS), a USD 45 billion organization, is a leading global automobile manufacturer of cars, utility vehicles, buses, trucks and defence vehicles. Part of the USD 100 billion Tata group, Tata Motors is India’s largest and the only OEM offering extensive range of integrated, smart and e-mobility solutions. Tata Motors has operations in the UK, South Korea, Thailand, South Africa, and Indonesia through a strong global network of 109 subsidiary and associate companies, including Jaguar Land Rover in the UK and Tata Daewoo in South Korea.